What is the U3A or University of the Third Age? U3As are autonomous, self-help organisations run by the voluntary efforts of their members. They are self-managed lifelong learning co-operatives for people no longer in full-time work. The word “university” in our title is used in its original sense of people coming together to share and pursue learning in all its forms. We do not offer formal tuition or qualifications. Orkney U3A is a member of the Third Age Trust, which is the national support and advisory body in the UK. We are part of the Scotland U3A region. 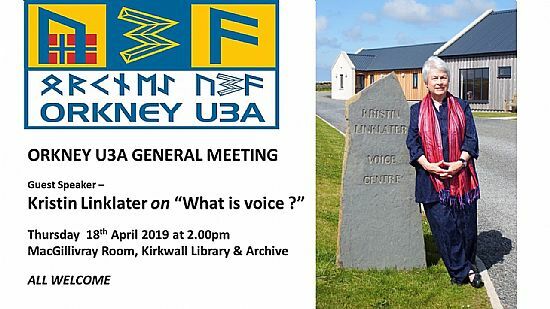 Orkney U3A was established in 2008 and currently has around 100 members. We have monthly General Meetings with speakers on a wide range of topics. These are held in the MacGillivray Room at Kirkwall Library and Archive. Please have a look at our Programme page for details of these meetings. Special interest groups meet at various venues where members enjoy learning by participating in subjects including botany, birdwatching, photography, music, play reading, Scrabble, straw work and crafts. For more information please have a look at our Groups page. You can also catch up with recent events by looking at the group reports or Blogs. You are welcome to attend one of our monthly meeting to sample our hospitality and put faces to names.